The Astronomer and I traveled to Boston this past Memorial Day weekend for a family wedding. While most of our time was spent with relatives, we managed to carve out a few hours to meet up with one of my best friends from college, Adrienne, and her wife Irene. B&G Oysters was the site of our joyous and delectable dinner. Chef Barbara Lynch‘s neighborhood oyster bar serves both New England classics and Mediterranean-inspired dishes in Boston’s South End. 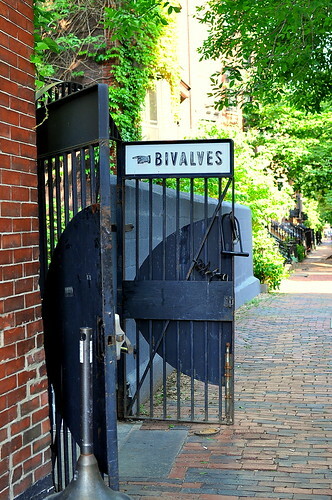 Each day this subterranean temple to oysters features 12 varieties of bivalves (six from each coast), all delivered fresh that morning. We snagged a reservation a few days before at the highly desirable hour of 4:30. Unsurprisingly, we were lead to our table as soon as we arrived. 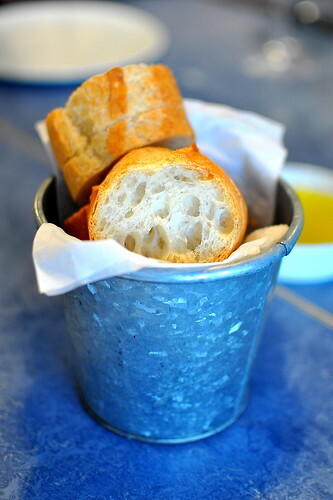 After we placed our order for the first wave of dishes, our waitress brought over a tin pail of bread with a grassy olive oil on the side. Since Adrienne, Irene, and The Astronomer weren’t gaga about oysters, I decided to forgo the restaurant’s namesake specialty on this visit. There was plenty of other goodness to be had. 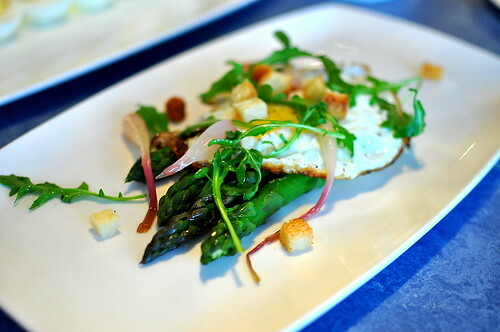 The warm asparagus salad ($15), which was served with pickled ramps, a fried egg, and croutons, looked deceptively plain, but all of the elements taken together brought on some mega fireworks. While I love to hate on foodies’ obsession with ramps, I had to admit that they really made this dish pop. 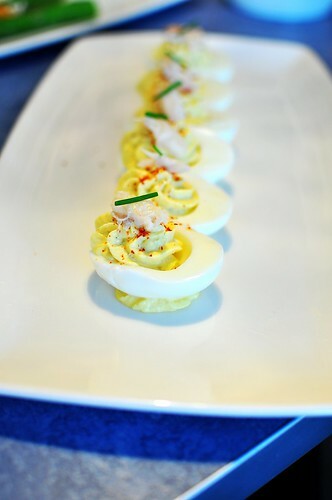 The deviled eggs ($16) were also solid. The creamy yolks came topped with sweet shards of Jonah crab and a dusting of espelette pepper. The filling was so good that we made sure to scrape up every last bit of it beneath each egg. 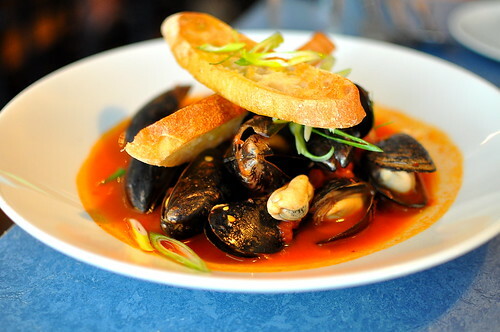 Round two brought a tremendous dish of steamed mussels ($16) bathing in a spicy tomato sauce with garlic bruschetta. While the mussels weren’t the plumpest ever (that honor would go to the monstrosities at Steelhead Diner in Seattle) they had a lovely flavor and delicate texture. 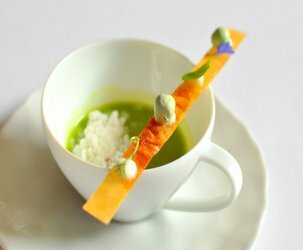 The broth was tangy and moreish. Just ask Irene—she sopped up every last drop with bread. 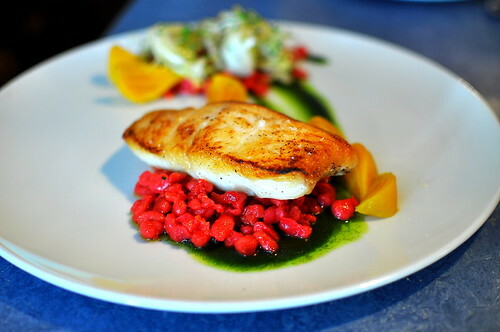 We also shared a perfectly prepared pan-roasted halibut ($30) served with florescent pink beet spaetzle, yellow beets, frisee, and an herb pesto. The dazzlingly hued spaetzle could not be beat. Our final savory dish of the night was B&G’s much-loved Maine lobster roll ($28). The lightly toasted bun was generously jammed with hunks of claw and tail meat lightly coated in mayonnaise. A smattering of chives and celery added the finishing touches. The roll was accompanied by hand-cut fries, house-made bread and butter pickles, and coleslaw. While the roll was delicious on all fronts, the Connecticut-style roll at Neptune Oyster remains my favorite in the city. Hot butter-drenched lobster will always trump cold mayo-dressed lobster in my book. With three dessert-loving women at the table, we had to order all three of the desserts on the menu this evening. 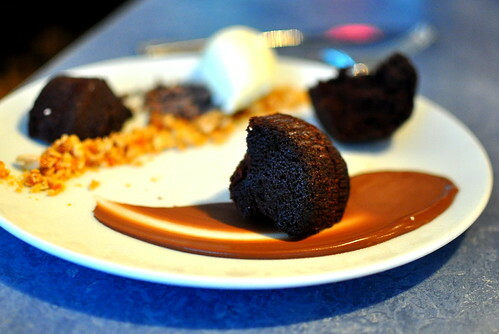 The chocolate torte ($9) was accented with crunchy bits of peanut praline and a quenelle of vanilla mascarpone. I knew The Astronomer would love the cinnamon pavlova ($9) with red wine poached pears and an oat crumble the moment I spotted it on the menu. 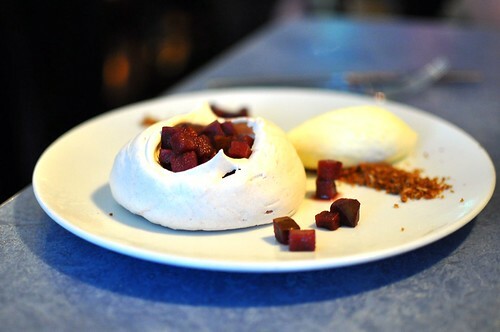 The ever-so-light spiced meringue wowed him as well as the entire table. I must recreate this dessert once pear season rolls around again. 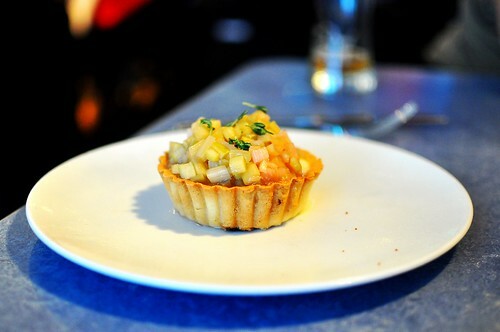 And finally, a seasonal rhubarb tartlet ($9) with pastry cream and thyme. Fruits and savory herbs are forever a winning combination. 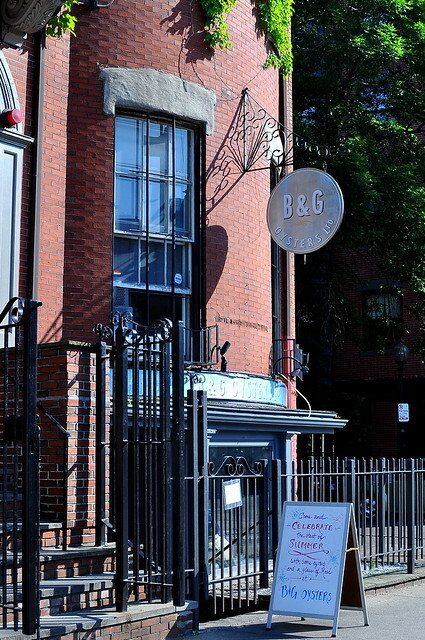 Good food and good friends—I had a ball at B&G. Can’t wait to try it out when I move. Warm asparagus salad & Lobster roll is in my future. MMM…good thing we tried (almost) everything on the menu 🙂 Loved those hipster ramps but the beet spaetzle can’t be beat! Pleeease invite me over when you recreate that cinnamon pavlova. 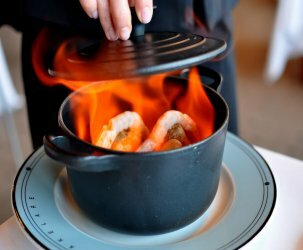 As an overall restaurant, did you enjoy B&G or Neptune more? Waleed – I think I enjoyed them about the same. The space at B&G is brighter, especially the patio seating, so in that regard I’d give it a slight advantage. Neptune, if I recall correctly, only has windows in the front so the room is a bit dark. Food-wise, it’s a draw. 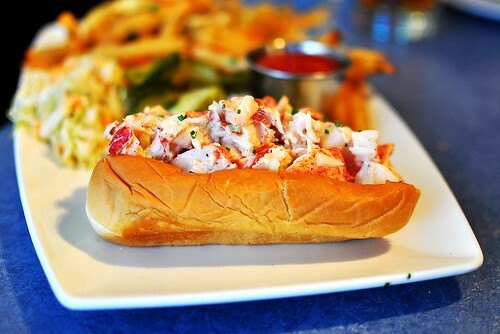 If you like a CT style lobster roll you have to try one made in CT. Ones made in Boston and LA are copy cats and maybe not fully done right to get full flavor! I watched one being made in a restaurant called “Two Little Fish” located on CT/RI line and it was an awesome show of how it’s put together. 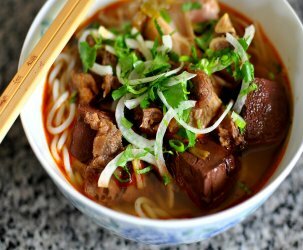 My wife was hooked on first bite and would only order it when we visited the restaurant. I found two other CT restaurants that made the CT lobster roll that were large and excellent! Ken – That sounds AMAZING! One day I hope make it to Two Little Fish for a legit CT roll. I love that you went to an oyster place and didn’t have oysters. The asparagus and desserts seem worth the trip alone!